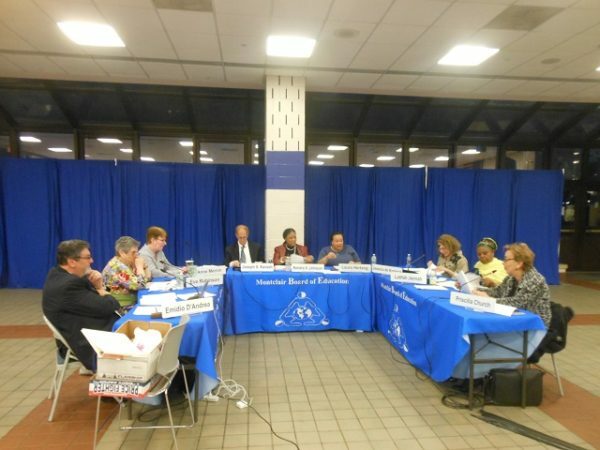 The Montclair Board of Education held an uncharacteristically short meeting on April 3 with an equally uncharacteristically light agenda. The 2018-19 school year budget was not a big topic of discussion, though there was some reference to it in public comment. Schools Superintendent Kendra Johnson opened the meeting by informing the board and the few Montclair residents at the meeting that the district is redesigning its K-12 language program and is pursuing two language-instruction initiatives. The first is testing eighth-grade students at the two main middle schools and Renaissance School to measure proficiency in the targeted language, be it in reading, writing or speaking. She said it was a pilot program, so it would not have an influence on student placement. The second is participation in the New Jersey Seal of Bi-Literacy program, which awards official seals of proficiency to students who have distinguished themselves in world languages. Superintendent Johnson reported that as many as 43 Montclair High School students who are soon to graduate earned these seals in French, Spanish and even Bulgarian, and one student is even slated for receiving a seal of recognition for linguistic proficiency in two world languages. The students will receive their seals at a future school board meeting. 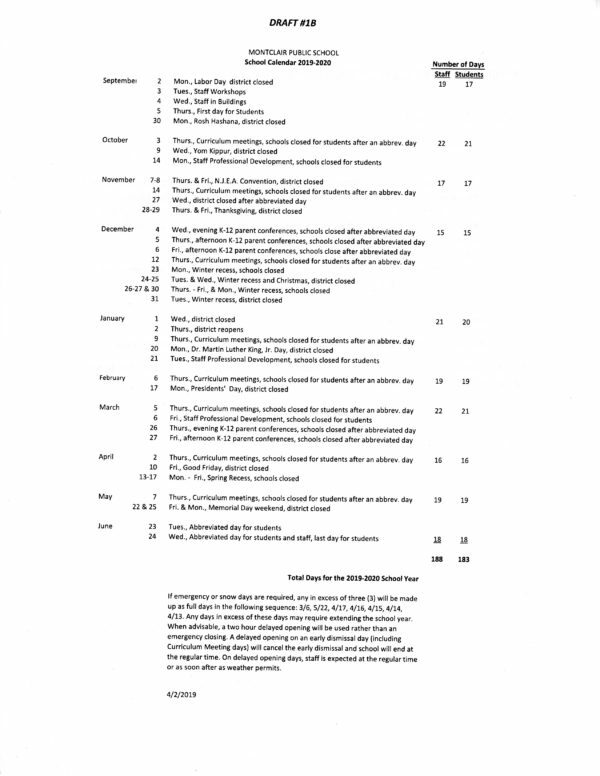 The board was primarily concerned with the new 2019-20 school calendar, and Superintendent Johnson announced she chose the calendar option, a draft of which was available at the meeting as a handout – “Option B,” which features once-monthly professional development days – called “curriculum meeting” days on the handout – from October to May, which would involve half-day sessions for the students. The board also chose to have school on the three election days during the school year. A general election is scheduled for November 5, while the quadrennial Montclair mayor/council election is to be held sometime in May 2020 (likely May 5 or May 12, the first and second Tuesdays of the month); the state primary election, which includes elections for major-party convention delegates for presidential candidates, is scheduled for June 2. The board decided to hire security for the elections to ensure the safety of both students and voters, and Board President Laura Hertzog said the township has offered to help pay for the security service. One issue the board has not decided is whether the professional development days should be on Thursdays or Fridays. Board members debated whether Fridays would be preferable to Thursdays, because having early dismissals on Fridays would allow families to plan for extended, unbroken 2½-day weekends. President Hertzog made the suggestion that the eight scheduled professional development days be evenly divided, four on Thursdays and four on Fridays, and Superintendent Johnson said she would look into that. In public comment, recent Montclair High School graduate Noah Gale objected to having school on election days, saying that the effort to secure the polling places at school during regular school days wasn’t worth it. Resident Fran Moccio directly addressed the budget, saying that a one-student-to-one-paraprofessional ratio was what the people of Montclair wanted, and while a different ratio may be alright for school districts like Nutley or Caldwell/West Caldwell, it was not all alright for Montclair, and that the board should bend to the will of the popular majority. She also questioned the $200,000 line for “miscellaneous building matters” in the operating budget. Superintendent Johnson said this line item was intended for unexpected repairs and to serve as an emergency fund that frees the school board from having to go to the Board of School Estimate for capital funding. Also in public comment, resident Colleen Daly Martinez addressed the issue of a Montclair High School teacher who was transferred, then later removed for yelling at and berating a student during class. She urged that the student and the student’s classmates be allowed to freely express how they felt about the incident, saying it was important to do so to support the mental health of the student body. Meanwhile, Business Administrator Emidio D’Andrea reported that he received word from the New Jersey Schools Development Authority, which monitors construction and upkeep of school facilities throughout the state, in an April 2nd notification that the Montclair district is to be reimbursed an additional $136,000 for the 2018-19 school year, for a total of $244,000 for the year overall. D’Andrea said he has been working with a consultant on reimbursements for school infrastructure projects, and the consultant has had $1.2 million reimbursed to Montclair to date for various completed projects. The money goes back to the township, which it can use toward the township or apply it to tax relief for residents. Speaking of construction, D’Andrea updated the school board on efforts to get staircase repairs at the high school going. Bids opened that day for contractors, with the plan to award a bid at the board’s April 15 meeting. Asbestos abatement on the staircases is slated to begin on May 20 and be completed by the July 1, with new staircases to be installed by August 23, the penultimate Friday before classes open for the 2019-20 school year. The board also approved an authorization to solicit bids for a field turf replacement project at Watchung School, which also includes work on a new playground. D’Andrea said that the bidding process will allow the board to gather information on how much the project would likely cost, and he added that the district will have a plan for it ready by the time the bidding opens.